Today, 4th and 5th Grade students at Wakelee Elementary School put on two separate band concerts for their families and peers. Led by Mr. Jason Fontaine, the students did a tremendous job showing off all of their hard work throughout the school year. 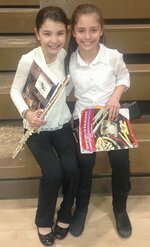 Many instruments were represented in both full orchestra, duets, and solos.